In Part I we looked at how both Shakespeare and the writers of Westworld depict humanity emerging through extreme suffering. In Part II, we turn our attention to loops and the deterministic life. This quote is not in Westworld (so far! ), but the parallels are clear. In the play, Macbeth is given his “narrative” by the Three Witches. In fact the play forces the audience to question whether Macbeth has free will or whether the witches control his fate. (The Three Witches tell Macbeth at the beginning of the play that he will become king, which causes Macbeth and Lady Macbeth to commit numerous acts of murder to achieve that and maintain it. Read the play!) At the end of the play through his soliloquy, Macbeth reveals what he believes to be the truth: humans are actors on a stage, they are given a role to play, and then they perish. He shows his disgust for the writer of his narrative, which could be interpreted as God or some other creator or Shakespeare himself (the role of creator is discussed in Part III). The irony is that even here, Macbeth is not in control; he acknowledges that even his disdain for the writer is written and he does not escape his fate. His suffering causes him to become aware that he was made and that his life is deterministic — Macbeth becomes conscious through the words of the script writer, but he is still unable to stop the fulfillment of the Weird Sisters’ prophesy. At the end of the play, Macduff (his nemesis who vows to avenge the murdered King Duncan) gives Macbeth an opportunity for him to “break the cycle” and live, but Macbeth would rather go through with his ending than be ridiculed by Macduff for the rest of his life. The real question is, is Macbeth really making a choice at all when he chooses to die versus live in shame? Both Westworld and Shakespeare question what is part of the loop of every day life and what is not. 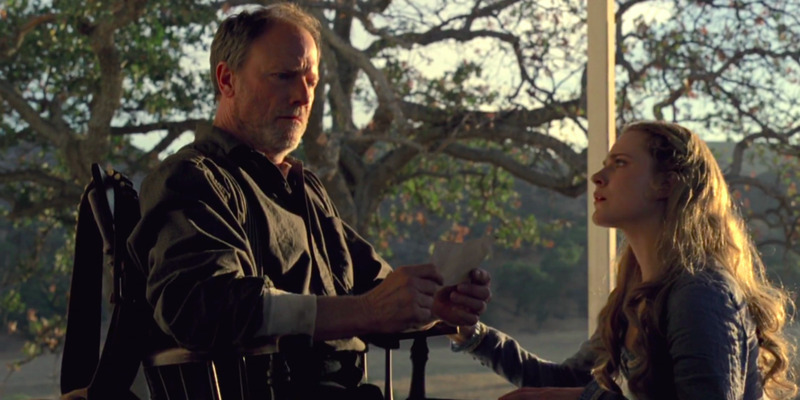 In Westworld, repetitive suffering does not result in consciousness; Dolores' family is killed and she is raped in each re-telling of her story, and she and the other hosts only awaken when they are shaken by something outside of their everyday experience. Here, Westworld informs the reading of Macbeth. Westworld’s extensive, creative, and tactful use of Shakespeare makes it a useful commentary on his plays that cannot be ignored. Because Dolores’ repeating traumatic experience does not grant her sentience, we can question whether Macbeth is granted it, too, therefore making the suffering of these two characters meaningless; their suffering must be even more extreme (as discussed in Part I) for them to be shaken out of their complacent story line. Dolores, like Maeve, is granted it when the Man in Black tortures her to find ultimate meaning in the park. Macbeth is given sentience immediately after the death of Lady Macbeth, one of the only events that was not foretold by the Weird Sisters. This one act outside of the script is what saved Macbeth and elevated him to full awareness. He has finally understood that he is an actor on a stage, as are all persons. Westworld creates a world where the creatures living in it are almost literally actors on a stage. Since the hosts live in the game world of Westworld, it is clear that their purpose is to serve the guests of the park. Unlike in Shakespeare, it is obvious from the outset that the character’s lives do not have an intrinsic, deeper meaning than what is beyond the park, at least not one that is given to them by their creators, which is one of the messages in the show: lives caught in loops are not significant and the people living those lives are not fully human. Depicting the hosts going about their pre-programmed day alone does not drive the message home. But by showing Peter, Dolores, and Maeve all gaining consciousness through suffering, the writers are telling the audience that this is how we, humans, attain our humanity. In the season finale, Dr. Ford explains this to Bernard, eliminating any ambiguity: “…the thing that led the hosts to their awakening: suffering, pain that the world is not as you want it to be…. And I’m afraid that in order to escape this place you will need to suffer more”. Many organisms and natural processes have loops or cycles: tides rise and fall, ants are drones that serve the colony. We would similarly be mindless and mundane were it not for our suffering. Trauma is jarring and yanks us out of the sleepwalk of everyday life. Feeling pain is what makes us human and what gives rise to consciousness, according to both Westworld and Shakespeare. Peter echoes the meaninglessness of life and connects the stage to life when he quotes King Lear in the first episode: “When we are born we cry that we are come to this great stage fools”. Peter speaks literally and metaphorically; Westworld is as much a stage as is a Shakespearean play. The interconnected narratives designed by Sizemore and his team determine what a host does, and these little stories are repeated forever until a guest interrupts them. The hosts are born into a world of fools: actors following their scripts and humans not fully understanding the horror what they have created. All of the other living things tirelessly go through the motions of their programming. Lear, in his interpretation of the world as a “stage” and the people as “fools”, refers to the inability to choose to exist and into what kind of world humans are born; humans are given a part in a play and are compelled to follow the script. Again, these loops are only interesting to the reader if the characters change, if they become aware of themselves and their actions. Furthermore, if the story is predictable it becomes less interesting, so a cliché or overused trope will not ignite consciousness in the characters or hosts; it needs to be jarring and unexpected or the life and narrative are insignificant. This marks the debut of Deconstructing Westworld, a series of essays that will explore the themes, characters, and world of the HBO show, Westworld. For this first piece, I want to put forward some questions and themes to explore from the premiere episode “The Original”. But before that, let me explain how I will deal with spoilers. You should assume that each essay will contain spoilers for all episodes released prior to the publication date of the essay. I will include this warning at the beginning of each piece. I thought about how to deal with spoilers and decided that trying to restrict each essay to a certain set of episodes would be too difficult, especially because most of the time I will be writing about broad themes that span several episodes and, later, more than one season (i.e. I will not do per episode analyses. Other sites are great at that). And now, on to the themes. The theme of agency is significant in the show. Who has agency and who bestows agency? For example, Dolores is under the control of her programming and at the mercy of the Man in Black in the first episode. She lacks control of her own life and is severely abused. But by the end of the episode, it is made clear that she has “woken up” when she kills the fly that lands on her neck; she has gained agency. The theme of Dolores’s agency will be the subject of a forthcoming essay. We also witness Old Bill zipping himself into a body bag when Dr. Ford gives a command; humans have ultimate control over the life and death of the hosts. The idea of “waking up” is interesting. We witness several characters waking up, both in Westworld and in the company diagnostic center. Waking up and dreaming are both literal and metaphorical, and will likely play a large role throughout the show. Two recurring motifs are the fly and milk. What functions do they have in the show? The fly is particularly interesting, as it appears in other stories, most notably Breaking Bad. We may speculate from the first episode what they might mean, but I will probably wait to write an essay until we see more instances of these two. The blurring of reality is another theme that will be explored here. It starts with Teddy appearing to be human until he is killed by the Man in Black partway through the episode. The nature of physical reality (What is real? What is human?) is an obvious theme ripe for analysis and will likely be a long essay released after the end of the first season. Shakespeare. Shakespeare appears via the first Peter Abernathy. Why does Peter quote Shakespeare? Is it because he is playing a recording from his previous builds, as Dr. Ford concludes? Was he trying to threaten his creators and used Shakespeare for dramatic effect? This theme will hopefully reappear and we can analyze how the writers incorporate Shakespeare into this world. Westworld itself is a kind of play, a “stage” with “actors” with roles to play. Shakespeare in relation to Westworld will be a fun theme to write about, assuming it reccurs in forthcoming episodes (I think it will). Dr. Ford’s speech on human evolution was predictable and a common theme in robot stories. I will need to do more background research to do this topic full justice in an essay, but I will eventually write about evolution and “passing the baton” to our synthetic successors. Those are some of the big themes that emerged from the first episode. I will not even try to keep up with the show with my writing; there is so much to write about that it will keep me busy while the show is running and also in between seasons. If you have a theme or question worth exploring, tell me about it on Medium or on Twitter: @garrekstemo.